December 10, 2003 NASA's Mars Reconnaissance Orbiter dips into the thin martian atmosphere to adjust its orbit in this artist's concept illustration. NASA plans to launch this multipurpose spacecraft in August 2005 for arrival at Mars in March 2006. The plans call for controlled use of atmospheric friction in a process called aerobraking for about six months after arrival to change the initial, very elongated orbit into a rounder shape optimal for science operations. Mars Reconnaissance Orbiter is designed to advance our understanding of Mars through detailed observation, to examine potential landing sites for future surface missions and to provide a high-data-rate communications relay for those missions. 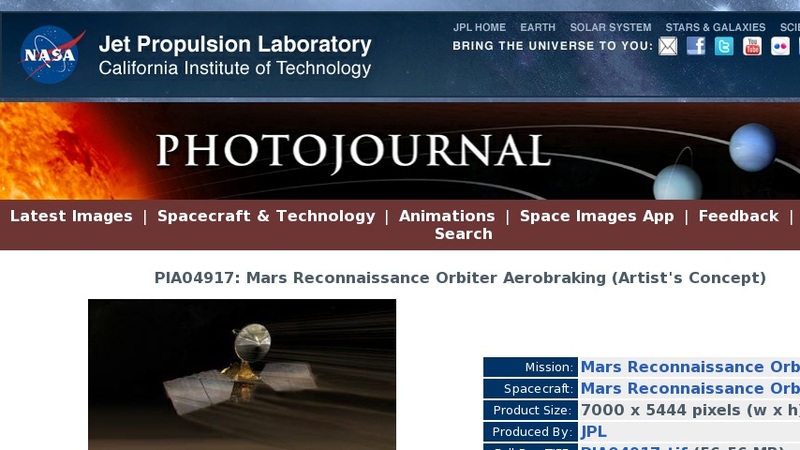 NASA's Jet Propulsion Laboratory, a division of the California Institute of Technology, Pasadena, manages the Mars Reconnaissance Orbiter Project for the NASA Office of Space Science, Washington. JPL's main industrial partner in the project, Lockheed Martin Space Systems, Denver, Colo., is building the spacecraft.